Provenance: I first found this book in an airport bookstore, mis-shelved. It is a history of the Russian Revolution, but it was in the Science Fiction section. Which makes sense in that China Miéville is a noted SF/Fantasy writer of the "New Weird" school, best known for books like Perdido Street Station, Un Lun Dun, and The City and The City. But I did not pick it up then. Instead I purchased it at Third Place Books in Ravenna, a tidy little neighborhood bookshop. On the day of purchase, Third Place was donating their profits to organizations working against the brutal immigration policies of the current administration (and ICE in particular). So a political book purchase made perfect sense. Review: I'll fess up, despite a lot of reading, I have only a passing knowledge of the Russian Revolution. The storming of the Winter Palace, Rasputin. Lenin. The Battleship Potemkin, Reds with Warren Beatty. Yet in my brain the events of the Revolution itself unspooled almost simultaneously. One day there was a monarchy, the next day the Soviet Union. Actually, it was a continual and chaotic clusterfreak, unrolling over a period of months, with Saint Petersburg (which becomes Petrograd and will eventually become Leningrad before returning to Saint Petersburg in 1991) at its center. Then the heart of the Russian government, it was here that the people's uprising mattered. Out in the hinters of Baku or Finland or Moscow, rebellions of the workers could arise, either to the be crushed or to find some limited amount of autonomy away from the wellspring of then-modern Russia. There are histories built around Great Men. There are histories built around Great Moments. Miéville's approach is built around Great Meetings. And there are a lot of them in the tempestuous times.The Duma, the provisional government, the nascent Soviet, the various factions within the revolution, the gathering of a dozen Bolsheviks when Lenin was on the lam from accusations he was a German agents. Meeting upon meeting, faction upon faction. How many factions were there? Take a dinner plate, hold it at an arm's length, and drop it on concrete. That many. Bolsheviks, Mensheviks, Mezhriontskys, Socialist Revolutionaries, Kadets (Constitutional Democratic Party), the Military Revolutionary Committee, various garrisons, and subfactions of the above that range from moderate to revolutionary. The difference between the two big factions, Bolsheviks and Mensheviks, is whether the worker's paradise has to go through an intermediate stage of bourgeoisie, as the masses need to get up to speed with the concept of self-rule (The Mensheviks said yes, the Bolsheviks said no, and Lenin thought that if you topple everything right now, the rest of a war-torn Europe would quickly follow). Miéville openly skews left/socialist politically, and that shows in where his attention lies. We get a lot of the Bolsheviks and their meetings, while the right shows up in turns as ineffective foil or a threatening counter-revolutionary force. Nicholas abdicates and vanishes from this narrative. The Duma, tethered to the Soviet in a dance of dependency, is rarely effective (and the Soviet itself, like Caesar, rejects opportunities to take command until forced to by Lenin's wing of the Bolsheviks). He demurs on whether things could have gone differently, or if the horrors of Lenin and Stalin were "baked into" the Bolshevik Revolution itself. There were more than enough opportunities for a different faction, or collection of factions, to "win" the prize of a starving Russian state. Miéville is also a urbanist, and most of his fiction is city-based or community-based (The Armada from The Scar, the railroad town from The Iron Council). So he is at home in this not-as-ancient city, built like Washington, DC to house a ruling class and a government. He is at his best when he is describing the city itself, and its inhabitants, either scrounging for food, marching in protests, or defending the barricades against the counter-revolution. 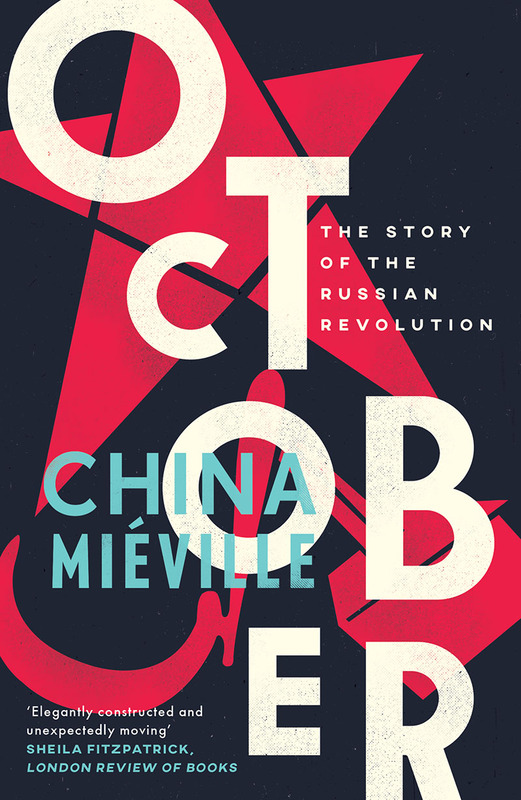 Miéville captures the flavor and the feeling of those turbulent months of 1917 where Russia hung suspended through a decaying old system and and an unborn, chaotic new one. We stop in October, with the Czar still alive, the nation still at war, and the Civil War yet to fully kick off. Miéville tells a great story, but it is an incomplete one, with the great tragedies yet to come. The retro-vision of "what would be" colors our judgement of those hides the concept that the future of the Revolution hinged on a single decision, a single political act, or a single meeting. Here's my deal on reviews: I have to play the game in order to review it properly. Reviewing a game or game adventure without playing it is akin to reviewing a play simply from its script. Now. uou can review a script as a script, analyzing why it works and how, and guess how it will all play out, but you really aren't reviewing a performance. For that reason, I read a lot of RPGs and adventures but don't review them. I'm more than willing to promote stuff I haven't played, particularly by friends and colleagues, but reviewing? Not so much. Oh, and there will be spoilerish things here, so if you want to run this, or never will run this, proceed, but if you want the thrill of playing in it (and its a bit of thrill ride), you can bail now. My regular Saturday night group has of late been more anime and kaiju movies of late, particularly since we wrapped up the massive Horror on the Orient Express (which I COULD review under my rules, because I was a player,but not a GM/Keeper). I came across this at The Dreaming, up in Seattle's U-District (good comic and game store - my choice for the Lovecraftian stuff), and since we HAD wrapped up Horror, thought this a good tie-in. Now Horror was set in the 1920s and ranged between London and Constantinople and back again, but the latest incarnation also had a number of vignettes for the past that helped fill in bits and pieces of the story. These vignettes had pregens and gave the players a break from playing their normal characters. Cool idea, particularly since Call of Cthulhu can have a rather lethal body count. 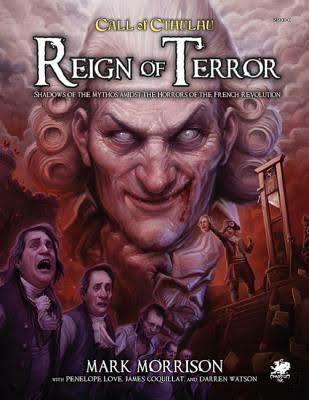 Reign of Terror is really two adventures. 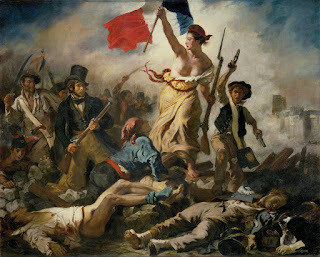 The first takes place in Paris in 1789, at the dawn of the revolution, and the second five years later at the height of the Terror, when the guillotine made messy work of those who were out of favor. The second part happens five years later, after the revolution and the Terror that followed. This is the age of the guillotine, where informers are rampant and the ambitious use false accusation to clear out political and personal opponents. A minor character from the first adventure gets hold of unspeakable knowledge and plans to sacrifice all of Paris to an Elder God (I did mention spoilers, right?). This part didn't work nearly as smoothly, for several reasons. One is that in the first section, the players are all effectively on the same team - they are soldiers, one of them in the sergeant, so there is chain of command. Also they have specific orders and are expected to obey. And they can expect some sort of support from their superiors. In the wake of the revolution, though, that command is broken down. Not all the characters are still in the army (our romantic young soldier is the group became disillusioned, quit the army, and became a busker on the streets), and some of them may have actually fired on each other at the Bastille. They don';t have superiors who are giving them direct orders, and have a lot more leeway in their actions. In fact, the adventure turns on the characters, who previously have been expected to obey orders, disobeying those orders for the plot to proceed. In our case, they chose to not disobey orders, forcing the Keeper into quickly coming up with how to proceed the story further. Often, keeping the story moving forward has the whiff of railroading, but this was a case where the game leaves you a bit high and dry as how to proceed (we managed, but it required some impromptu rewiring). A second challenge is that both big bads are very similar. Singular, aggressive, elite, and powerful (both in physical abilities and in social position). Both are unkillable until a certain set of circumstances come together. Their goals are very different, but how the players interact with them is similar. In the case of the second adventure, the second big bad taunted the characters with a very Fenalik sort of grin, and AT THAT MOMENT the group decided that, whatever he was up to, they were going to take him down. They skipped the next two sections of investigation and went directly to judicious application of kegs of gunpowder in a closed space to defeat him. Third, and this is one of the biggest challenges of the second half, the shadow of the guillotine hangs over them, but the process of how one gets there is unclear. How is the arrest made? How long do you sit in jail before the kangaroo court sets down a decision? The book does talk about such things as how condemnations functions, but not once the process is rolling There's a definite gap between The Second Big Bad decides to send the Committee for Public Safety against the players and the tumbril rolling up to the guillotine, and one that the keeper had to play by ear..
Production values are extremely high in the final product. The art is wonderful, and the page layour both clear and sumptuous. One challenge as games move to full-color production is the handouts - Older CoC games benefited from easily photocopied handouts. 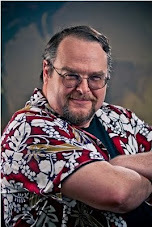 Chaosium has the handouts on their site, but while that works for players with electronic media or color printers, the old fashioned among us with B/W printers and photocopiers have to deal with it. of the Revolution painted forty years later. The presentation also has some padding. Two-page spreads of famous art. No less than 6 maps of Paris. A full-page reproduction of the Rights of Man (in French). Good stuff, but there it is occupying space we can for other things. What other things? A short bit to be read to players of what happens between part one and part two would be good (and don't lecture me on boxed text - there is a BIG section at the start of the adventure). 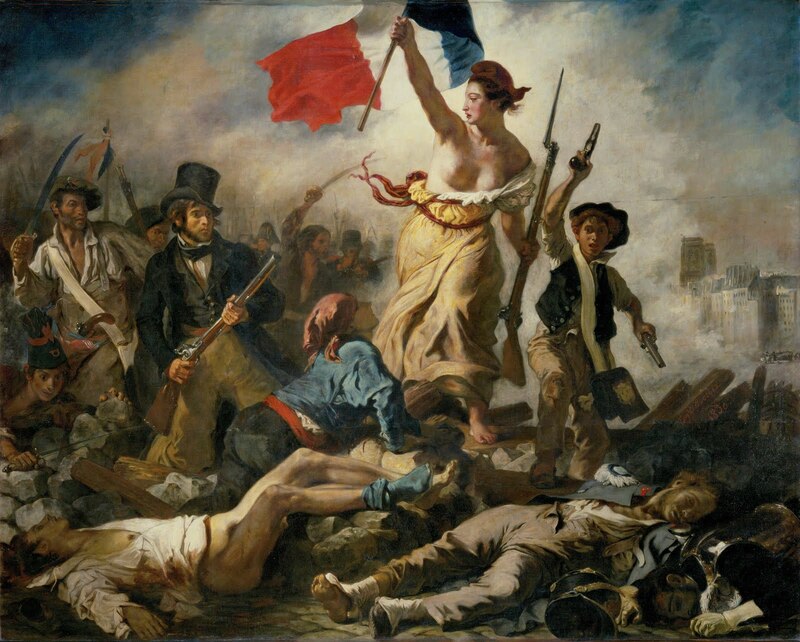 There is a lot of data in the book on the French Revolution, much of which is aimed from a historical end and less from the viewpoint of those on the ground (short version - it sucked). For all the information provided for the characters, I had to wing it on whether the soldiers had a barracks or what (I went with yes, but the commander lived with his family nearby). Also, a pronunciation guide would help. Yes, we know what French sounds like, but I come from a part of the country where Versailles is pronounced Ver-SAILS and Dubois as DUE-boyz, so I am working through my high school French to manage pronunciation in places. None of my players have been to France (Quelle horreur! ), so in general we went with "Hollywood French", either ignoring pronunciation challenges or, sadly, rolling out a Ree-DEEK-you-louse Frange AcCENT. So, a guide would be useful tools for the Keeper. And the volume does suffer from the "Curse of Cthulhu" as far as map/text agreement. The dwarf violinist lives the garret of a three-story building, which has five floors on the map. The description of Fenelick's grounds don't quite line up with the text. And, while the Pregenned PCs have useful info, one of them is lacking a vital part as to his political alliances. (in the book. They did make the correction to the pdfs, so go there for the characters.). So in general? Not an adventure for a first-time keeper. First half is solid, and definitely good if you're playing/have played/would want to play Horror on the Orient Express. Second half requires more work from the Keeper and can potentially go off the rails. Keep the wikipedia handy so you know more about the Herbertists and Dantonists and why it would be important to a bunch of soldiers. But is also great for putting the players in two very different dystopic realms where life in cheap and justice cannot be found. From the golden halls of Versailles with its wealthy elites to its revolutionary remade France stalked by the Terror, the players are forced to deal with challenges to their characters beyond the traditional 1920's milieu. It is an excellent doorway into the past for playing the game. Check it out, but be prepared to work for it.